If you're a post-menopausal woman, you're at risk for osteoporosis. Sufficient calcium in your daily diet is one key way to help prevent this potentially life-altering disease. But how much, exactly, do you need? The National Osteoporosis Foundation recommends that men and women over age 50 get 1200mg of calcium daily, through diet and/or supplements. For some women at higher risk including breast cancer survivors taking an aromatase inhibitor the number jumps to 1500mg daily. How much calcium are YOU consuming every day? So, what if you don't love dairy" or it doesn't love you? Certain green leafy vegetables (kale, broccoli); and certain fish (salmon, sardines) are very high in calcium. But let's face it: broccoli, kale, sardines, and salmon aren't foods you're going to eat every day. So let's look at another alternative to dairy: foods fortified with calcium, the number of which are steadily increasing. Think fortified orange juice, and breakfast cereal, bread, snacks, and even some bottled waters. You don't even have to become a label-reader; anything fortified with calcium will probably blast it out right on the front of the package. Speaking of, most labels give calcium as "%DV," which means the percentage that food provides of the daily calcium amount the government has determined you need. Which is, conveniently, 1000mg. When you read a label that gives calcium as "20% DV*, that means that there are 200mg of calcium per serving in that food. Simple, huh? 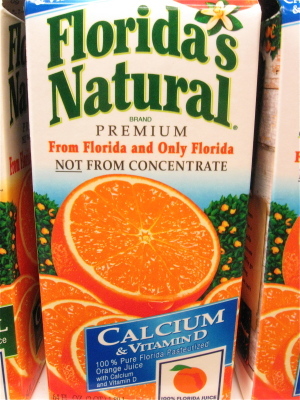 Just add a "0" to the percentage, and that's how many milligrams of calcium you're getting. 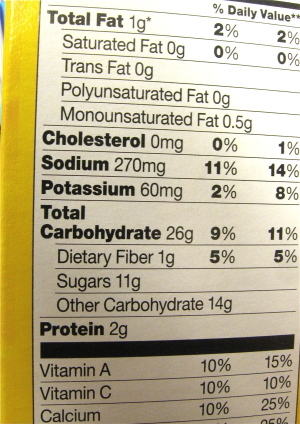 This is the nutritional panel from a box of Cheerios. See the "Calcium, 10%" at the bottom? Add a "0" to 10% to get 100mg of calcium in one serving of Cheerios. 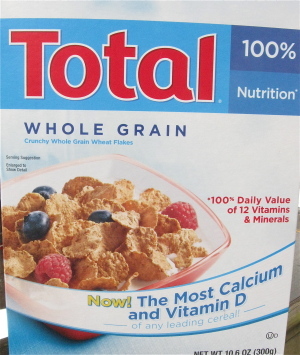 By the way, the nutritional panel also tells you how much 1 serving is for cereal, usually 3/4 or 1 cup. OK, let's cut to the chase. Here are 10 easy ways to make sure you're consuming enough calcium every day to keep your bones strong and healthy. Drink milk. It's the single easiest, least expensive source of calcium you can get. Skim, full fat, 2%, doesn't matter; all will give you about 300mg calcium per cup. Plus 25% of your recommended daily dose of vitamin D.
By the way, most soy milks also check in at 300mg calcium per cup, so if you're lactose-intolerant, soy is a great substitute. 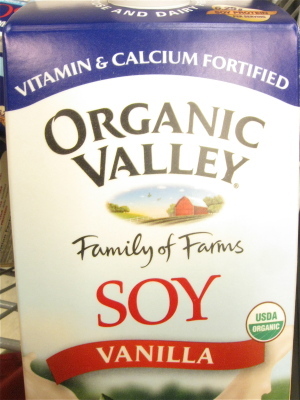 And, if you tiried soy milk years ago and thought "YUCK," try it again. It's lost its "grassy" taste, and while not exactly like milk, it's quite tasty. Don't love milk? Make sugar-free instant chocolate pudding; you'll get that same 300mg of calcium in a cup of pudding. Don't like chocolate pudding? You're kidding" Well, OK. Make an 8-ounce cup of coffee, and add 8 ounces of milk for a homemade latte. Same 300mg of calcium. And don't worry about that article you read that said caffeine compromises the ability of your body to absorb calcium; add just 1 tablespoon milk to any caffeinated beverage, and you're good to go. 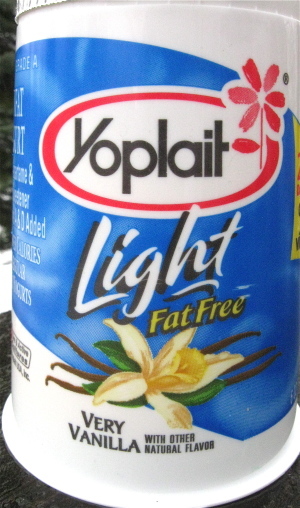 Snack on fat-free yogurt. A typical 6-ounce carton of yogurt offers 200mg to 250mg of calcium; some fortified yogurts are even higher. You say don't like yogurt, but have you tried it lately? You'll find everything from cherry vanilla to raspberry white chocolate, orange mango, and good ol' plain vanilla in the refrigerated section of your market. The fat-free versions are every bit as tasty full-fat; and "light" versions are also low in carbs. Drink a glass of fortified orange juice. 350mg of calcium in 8 ounces, I kid you not. That's about 25% of your daily requirement right there. Two glasses one in the morning, one as a mid-afternoon snack and you're halfway there. Start the day with calcium-fortified cereal. Many cereals typically offer about 100mg calcium per cup. A lot of sugary kids' cereals trumpet that they're a good source of calcium; but those that aren't as obvious are often just as good. Spend some time in the cereal aisle reading labels; you'll quickly find something you like that's a good source of calcium. Find good sources of calcium in unexpected places. For instance, almonds: A handful (1/4 cup) is good for 80mg of calcium, and is an excellent source of "healthy" fat. And, ladies, they're also considered a breast-healthy food. Dry-roasted, smoked, or, my favorite, wasabi-soy they're a wonderful taste treat. 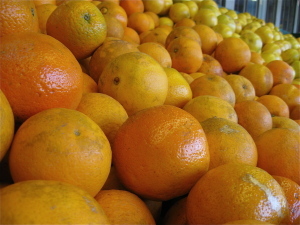 How about an orange? 60mg. A tomato? 32mg. A cup of blackberries has 46mg of calcium and an avocado, 22mg. Listen to your mother eat your frutis and veggies. They're nutritional powerhouses. And then there's spaghetti sauce. I picked up a bottle of Newman's Own Fire-Roasted Tomato and Garlic Pasta Sauce, and would you believe it has 60mg of calcium in a 1/2-cup serving? DO become a label-reader; you'll find calcium in some surprising places. Make ricotta cream, a standby of the South Beach diet. Mix part-skim ricotta cheese with Splenda (or with the artificial or natural sweetener of your choice). Add vanilla extract. Serve with a sprinkling of chocolate chips, or berries. A mere ½ cup of this truly tasty delight offers you an unbelievable 400mg of calcium. Check the labels of cereal bars and granola bars. Many offer up to 100mg calcium per bar. Heck, even some cookies are good for you a snack pack of fat-free Fig Newtons has 40mg of calcium. Who knew? Cheese, in all its incarnations, is a marvelous source of calcium. ½ cup of cottage cheese includes 100mg of calcium. 1 ounce of hard cheese a piece about 1" x 1" x 2" weighs in at 200mg calcium. And that's true for reduced-fat cheese, as well. 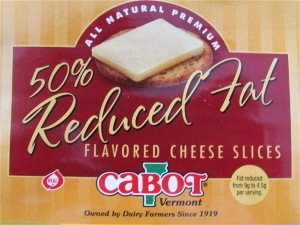 Now, don't turn up your nose at reduced-fat cheeses; if you haven't tasted Cabot's brand, or the offerings at Trader Joe's, you're missing the boat. They're excellent. If you still aren't getting enough calcium, take a supplement. Pop a Tums (200mg calcium). 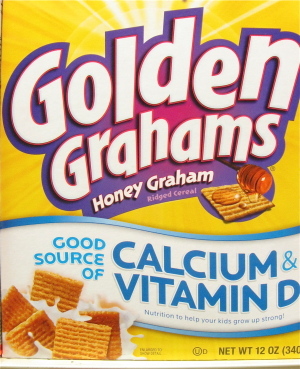 Or enjoy a caramel or chocolate Viactiv calcium chew 500mg calcium (plus about 2/3 of your daily vitamin D requirement). There are lots of palatable calcium supplements out there. But please don't rely on them for your entire daily dose of calcium; eating five Tums probably won't make you feel very good; and a bellyful of pills and tablets doesn't provide you with nearly the amount of nutrition and vitamins, beyond calcium, that natural foods do. Oh, and another thing: no calcium-loading. Your body can only absorb about 500mg of calcium at a time; the rest is sloughed away. So for efficiency's sake, eat only up to 500mg calcium at one sitting, with 3 hours or more in between. Eating smart and healthy to strengthen your bones doesn't have to be difficult or a challenge to the tastebuds. Take the time to acquaint yourself with calcium-rich foods, then make them a major part of your diet. Your bones will thank you.